il se moque du monde là ? Oda décide ce qu'il fait de ses persos que je sache. C'est certainement le mangaka qui a le plus d'influence au monde désormais donc qu'il nous fasse pas gober qu'il a les mains liées. Oda voit la vie comme Luffy, c'est fou. Et vas-y que je sacrifie ma santé pour mes rêves. J'espère que sa santé ne l'empêchera pas de finir OP comme il l'entend. Je pense qu’il faut penser en chapitres. 65%, ca fait encore 450 donc plus de 11 ans à 40 chapitres par an. Here is my brief summary for ONE PIECE editors' talk show in Tokyo Tower today. - Oda received tons of fan letters asking him to save Ace's life during Marineford War arc. - Editor Hattori asked Oda every week, "Are you really gonna kill Ace? I don't think it's a good idea.."
- However, Oda didn't understand why many audience are worried about Ace since he planned to kill Ace ever since his first appearance. - Basic course of events in the story is usually decided before the arc starts. However, Oda didn't have an intention to make Shanks appear in Marineford War. - Oda asks his editor what kinds of predictions audience have. Oda tries to go beyond their expectations. - Oda asked his editor, "What do you think if Ace turns out to be Roger's son?" The editor was very surprised to hear that. Oda was satisfied with his reaction and decided to go with this idea. - Oda goes mad when editor doesn't answer the phone, Editor holds his cell phone in his arms while sleeping so that he can answer the phone from Oda anytime. - Editor wanted to publish ONE PIECE Magazine every month in 2017, but Shueisha rejected since it would be too risky. 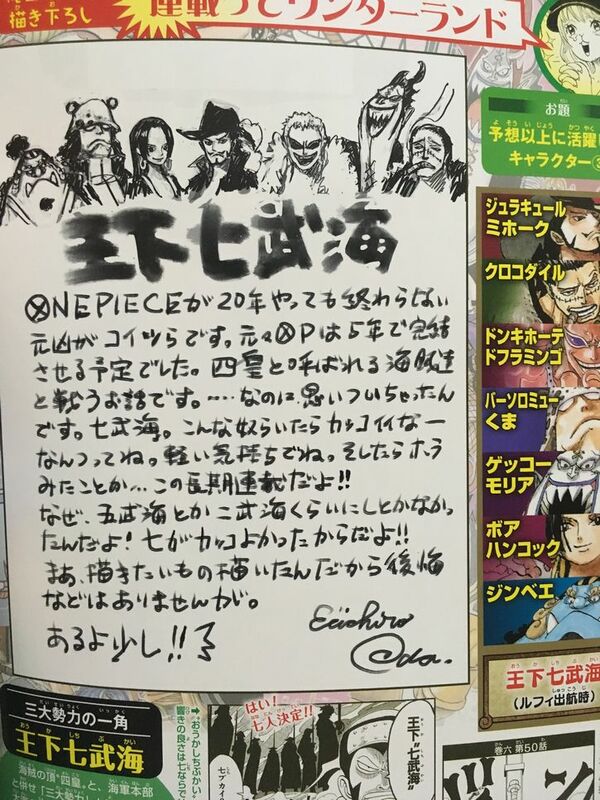 - Oda's comment about Wano arc will be included in ONE PIECE Magazine volume 2. - Editor Naito and Sugita already know what will happen in Wano arc. Both of them agree that the climax story in Wano arc is awesome. - Oda showed his BEST smile when he received a cake in OP 20th celebration party with his family and friends. Here is my summary for ONE PIECE Magazine volume 2 except for Ace novel and editors' short interview. - After becoming a mangaka, Oda noticed that his imagination ability of creating various stories is based on Rakugo, Japanese verbal entertainment. he played a cassette tape of Rakugo to entertain them, but all of them got bored in 5 minutes. - Oda started listening to Rakugo since his parents enjoyed Rakugo via cassette tapes. On the other hand, his elder sister didn't get attracted to it. - When Oda was around 12/13 years old, he was very glad that his parents kindly bought a ticket for Rakugo show in Kumamoto for his birthday present. - Oda meets Kosanji Yanagiya, one of the best Rakugo performer, once a year in Studio Ghibli. Toshio Suzuki, producer of Ghibli, invites Oda to his Rakugo event every year. - Oda believes he has never run out of ideas about ONE PIECE story because he knows a lot about classic Rakugo/film/Jidaigeki which survived the test of time. - Oda devoted himself to watching films in high school/college days. He watched 3 films per day. He got bored with current films soon and started focusing on classics. - Oda thinks perhaps the sound effect "Don!!" (ドン!!) in ONE PIECE is based on actors' overacting in classic Jidaigeki. Oda says he wants his audience to pay attention to the "Don!!" panel. - Oda considers a good sense of rhythm about words is important when creating sentences in ONE PIECE although he doesn't read many books. Oda sometimes keeps in mind that he should write sentences in 5-7-5 Japanese traditional poetic Haiku form. - The person Oda wants to meet most now is Quentin Tarantino. Oda also says that he has already met most of the people whom he wants to. - Oda at the age of 3-6 resolved to become a mangaka since he can make a living via drawing manga every day. he noticed that he needed to learn creating an interesting story when he was around 17 years old. - Oda was not convinced when his art teacher in junior high school didn't give the best grade to his good Toriyama-ish dragon drawing. Oda says he thought there was no difference between manga and art. - Before Oda became a professional mangaka, his editor often advised him to create well-defined manga characters. Some people even criticized that Luffy in "Romance Dawn" (prototype for ONE PIECE) didn't seem to move on its own. Oda says that himself didn't fully grasp the personality of Luffy at that time. - Oda remembers he was a rude person without knowing it before his debut as a professional mangaka. He talked to a legendary mangaka (HIroshi Motomiya) too casually in a party, which made staffs upset. no matter how mangaka talks about their hardships in detail. - Bandai company plans to sell OP goods based on SBS drawings of gender-bent/childhood characters although Oda just wants to draw them just for fun. - Oda says he'd like to keep being "a friendly funny guy in neighborhood" for kids who feels free to answer their requests to make drawings in SBS. Oda also says his drawings are not something very valuable. He says he is not a kind of mangaka who considers himself, "Even one line drawn by me can make much money!" - Oda "Be sure to look forward to Wano country. I refrain from revealing when I draw it, though." - Oda "There are tons of new characters I want to draw in Wano arc. Characters in ONE PIECE fight mostly on land despite them being pirates. I'd like to draw some event scenes on the sea which reminds us that they are pirates. Maybe I'll change my mind, though (laugh)"
- When Kuma was introduced for the first time in 2002, Oda told one of his assistants that Kuma would cause the separation of Straw Hats in the future. It came true in 2008. - The drawings of Amaru Enel are based on a elephant. - Oda is getting excited and doesn't eat food near the deadline for submitting manuscripts. Oda says food would make him sleepy. On the other hand, his assistants are getting exhausted near the deadline. - 3 assistants have been working under Oda for more than 15 years. The text says Shalom means peace in Hebrew and some other options mean sunflower in different languages. - There is an impressive line Oda didn't use in Enies Lobby arc. Luffy "Robin! Keep laughing! There's nothing to be afraid of! I'm with you!!" Robin sheds tears remembering Saul's words "Laugh when you are in hardships!! Dereshishishi"
Here is my translation for Oda's comment about Shichibukai in ONE PIECE The 23rd Log which is released today. The pic below is from 2ch. Here is my summary for Oda's interview in "Super Kabuki 2 ONE PIECE Grand Live" book released today. - Oda revealed it will take another 1-2 years for ONE PIECE to enter Wano arc. He also says Wano arc will include an episode about Ace. - Audience sometimes ask Oda about foreshadowing via fan letters, which makes him think, "OMG! I haven't mentioned it yet!" found in his author comment in chapter 422 in 2006.) Oda feels as if him and his audience are working together to create ONE PIECE. - The sound effect "BOOM/DON" (ドン) in ONE PIECE is based on Japanese drums as seen in highlight scenes in Jidaigeki. - Oda came up with the idea of Marineford Summit War long ago. - Oda says it's hard to talk about justice through Luffy's mouth since he is a pirate. So, Oda just puts a simple conclusion that the opposite side of justice is another justice. Oda says it's one of the main themes of ONE PIECE. - Oda says ONE PIECE has many flashback scenes as opposed to traditional Shonen mangas which didn't show much detailed backstories of characters. Oda thinks there are too many mangas out there these days which handles flashbacks. 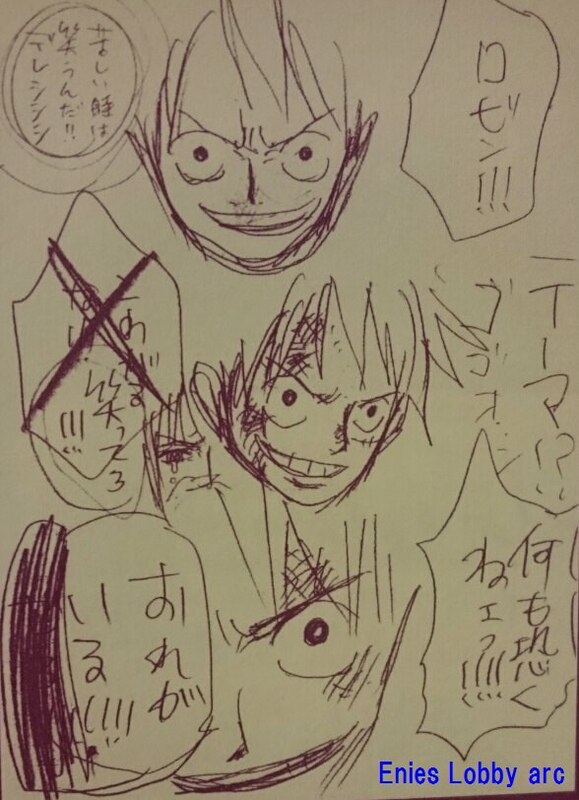 - Oda's effort for ONE PIECE is divided into drawings (40%) and story (60%). - Oda says the characteristics of islands in each arc are pretty different so that audience don't get bored. they sometimes complain even when Oda intentionally let Luffy do something unlike him. - Oda decided to make Luffy's design simple as possible as he could when he started OP since he thought the designs of other characters would gradually become more complicated . - The fundamental of ONE PIECE is that people help others desperately. Oda believes everyone loves this kind of story. Oda said the final arc will be so amazing that it will make Marineford War arc look like nothing. *You can buy this book on Amazon jp. The price is about 30 US dollars. [Correction] Oda mentioned it in the book released 2 days ago. However, it seems this interview itself was held back in June (page 94), which means it will take about another 7 months - 1 year and 7 months to enter Wano arc from now on based on Oda's estimation. Oda: I have to mention Law. Actually it's not too much to say that all Supernovas have more highlight scenes than I imagined. I created Supernovas right before the chapter where they got introduced. None of them existed in my plot notebooks before that chapter. I was in desperate situation, worrying, "At this rate, Sabaody arc will not be interesting enough." Then, inspiration for 9 Supernovas came to my mind unconsciously. I should have reduced the number of Supernovas since they were too many, but after all, I made all of them appear in manga!! I'm really surprised they survive till now since I thought about half of them would drop out of tough New World already. * Regarding this message, here are some trivia from interviews in 2010 ("Grand Countdown") and 2017. - The plan for breaking up Straw Hats was already decided when Kuma was introduced in chapter 233. Editor Onishi advised Oda to spice up the story in Sabaody. Oda replied, "Would it be interesting if new characters appear?" - Only 3 hours after this advice, Oda finished designing all Supernovas. On sent que le mec se laisse parfois border et inspirer par sa propre histoire.